What is textile conservation, what is textile restoration? Textile conservation describes the measures taken to preserve historical textile works of art and objects. A technical examination and documentation are the first steps taken to determine the importance of the object and its material condition. Conservation includes the stabilization of its existing state, prevention of further damage and steps to slow down normal organic decay. The term textile "restoration" continues to be used in Europe in place of or in addition to textile "conservation". However, textile conservation and textile restoration are not interchangeable. Textile "restoration" allows for an understanding of the object that has been (partially) lost due to damage or decay. The restoration can - in most cases - play a role in the conservation process. For example, a burial robe with a missing part can be underlaid with a custom-dyed support fabric, which is needed for the conservation process. As a result, the damaged textile is stabilized by the support fabric and allows for the robe to be seen as optically complete. The eye does not focus on the missing parts or imperfections, but allows the object to be seen as a whole. Restoration alone describes the recreation of a missing part, for example to re-weave a hole in a tapestry with the original design. What is the difference between conservator and restorer? Both terms are still used synonymously in the context of textile conservation. The English-speaking countries use the term "conservator", the German- and Roman-speaking countries prefer the term "restorer" as a professional title. The term "conservator" is used in German for professions that deal in the broader sense with the care and preservation of works of art. This shoud not be confused with the very specialized profession of textile conservation. Often, these conservators are art historians by training. The textile conservator/restorer is not yet a protected job title. Therefore, there are well-defined requirements from the International Council of Museums (ICOM) that anyone who works as a textile conservator must meet. I am creative, love arts and crafts. Would textile conservation be a profession for me? Conservation involves manual dexterity, but is not artistic or creative, as sometimes assumed. Textile conservation is a technical profession. As in surgery, where a surgeon works primarily with his hands, conservation is linked to extensive theoretical knowledge and experience. Conservation requires fundamental knowledge in science. The basis of the profession requires: inorganic and organic chemistry, textile chemistry, biology, physics, microscopy, and weave analysis (see ICOM, paragraph 5 "Training and Education of the Conservator-Restorer"). These subjects are mandatory for a successful completion of a conservation degree. Some subjects e.g. chemistry, physics and biology can even be prerequisites for the application to a university for a degree in textile conservation. Mastering art history and scientific writing is highly advantageous. It is necessary to produce technical documentation and reports and to understand analytical articles and research. "The creativity in this profession lies only in its problem solving" (Dr. Regula Schorta, Director of the Abegg Foundation). The student acquires a Master's Degree (MA in conservation-restoration) usually in a five-year program. Therefore, if you are interested in the subjects mentioned above and do not shy away from the technical and scientific aspects of the profession, there are no obstacles in obtaining a degree in textile conservation. Should I apply for an internship? You should definitely complete an internship. However, an internship alone is by no means a substitute for a university degree in textile conservation. A pre-program internship is in some cases a prerequisite for admission to study at a recognized university or university-level institution in the field of textile conservation. An internship will also help you learn if you have the necessary fine motor skills for textile conservation. I own a valuable textile object that I would like to preserve. How do I find a suitable textile conservator? 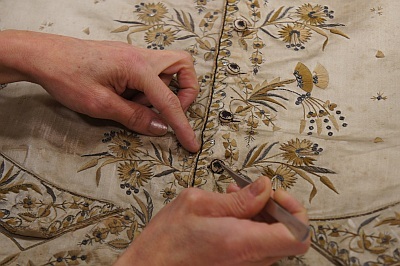 A search on the web will reveal many sites for textile conservators. However, one should critically examine the qualifications. This means that the selected person should have a degree in textile conservation and - depending on the value of the object - also be able to produce corresponding references. A membership in a restorers/conservation guild or organisation does not guarantee a person's qualification. The best way to inform oneself is a personal discussion with the textile conservator in question.